The Sauermann SI30-230V is a high-performance unit suitable for air-conditioning units of up to 5.6 tons. 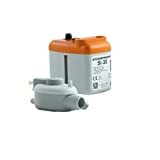 The Si-30 condensate pump by Sauermann uses piston technology that is specifically designed for removing condensates. The technology makes Si30 fully reliable irrespective of the environment. It also guarantees silent sound level irrespective of the volume it condensates. The independent tests show a quiet operation of about 20 dBA. The pump is capable of discharging small particles and it has a high resistance to pollution. The VCL-24ULS automatic condensate pump by Little Giant is designed for collecting, detecting and automatic removal of condensate from de-humidifiers, condensing boilers, high-efficiency furnaces, and other equipment. The pump comes with a 6ft power cord, 1-gallon ABS plastic tank and a safety switch. The pump also comes with a galvanized steel motor tank cover and stainless steel motor shaft. The units thermal-protected motor is CSA and UL listed and features two 1-1/8-inch diameter inlet openings. The safety switch can be programmed to shut down the condenser or wired to an alarm. If you are looking for a truly efficient condensate pump that you can install to pump the condensate produced in refrigeration, HVAC, steam system or a condensing boiler furnace, you should consider the CP-16 condensate removal pump by V-Max. The CP-16 condensate removal pump comes with a standard safety switch, 6-inch power cord and a thermal overload protected motor. The CP-16 vertical type condensate pump also features a 1/2 gallon leak-proof ABS water tank that is rustproof. The pump also comes with 3/8-inch OD barbed discharge adapter with a built-in check valve. Make your home comfortable with the Little Giant VCL-45ULS. The pump is designed for applications that need high head and high capacity automatic collection. 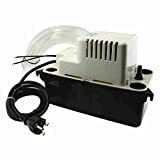 You can use the pump to remove condensate from air conditioning, dehumidification, and refrigeration equipment especially in areas where gravity drainage is not practical. The pump is also effective for high-efficiency gas and oil-fired condensing furnace and boiler equipment. To ensure safety, the unit comes with a 1 gallon ABS tank and a 6-foot cord for flexibility. The UL listed VCL-45ULS by Little Giant also comes with a thermal overload protection, a 1/5 HP motor and a stainless steel shaft. The VCMA-20ULST pump by Little Giant brings about unmatched reliability and guaranteed serviceability for every installation. The UL/ CSA listed condensate removal pump comes with a built-in check valve, stainless steel motor shaft, and thermal overload protection. The vertical type pump unit comes with a safety switch that you can program to shut air condenser down or wire to an alarm to warn you of in case of tank overflow. Quality, reliability and efficiency are some of the terms that define the SI-33 by Sauermann. The patented Sauermann technology makes the SI 33 condensate removal pump stand out for air-conditioning units of between 5.6 tons and 8.4 tons. 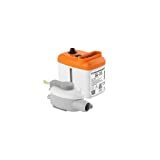 Featuring high flow rate and high performance, the unit is highly reliable in any environment. It also offers great savings due to reduced operation time and energy consumption. When it comes to condensate removal pumps ideal for air-conditioning units of up to 5.6 tons, the SI-10 mini pump by Sauermann is the preferred choice. Offering increased performance and proven reliability, the Sauermann SI-10 is perfect and reliable for use in any environment. Furthermore, with independently tested noise levels of 23 dBA, the unit offers quiet operation irrespective of the volume of condensates. Powered by 1/50 HP high-performance motor, the VCMA-15ULS by Little Giant is a fully automatic pump that comes with a safety switch that can be wired to an alarm system to raise a warning of possible tank overflow or shut down the air conditioner. With a thermally protected motor and a high-impact ABS tank, the unit is designed for performance and longevity especially in applications that produce an acidic condensate. At 3 feet of lift, the Star condensate pump has the ability to remove up to 76 gallons condensate per hour. With the bearingless sealed motor and a tough ABS plastic, the unit is designed for greater reliability and longer life. The pump can also handle condensate up to 150 degrees Fahrenheit thanks to its high-temperature rating. The unit also comes with 3/8-inch ID discharge with an included check valve. With 1/2-inch copper compression charge, thermal overload protector and safety switch, the condensate pump by Hartell offers reliability and efficiency. 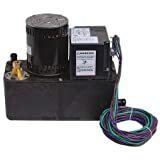 Powered by 1/2 HP 510 Watts motor, the Hartell condensate pump offers a maximum pressure of 26 psi and can withstand a maximum temperature of 212 degrees F. Other features of Hartell condensate removal pump include 13 ft cord length, stainless steel shaft, polypropylene float, thermal overload protector and safety switch. To choose the best condensate removal pump, you must first understand the application including handling and disposal regulations. You should also figure out the lift requirement for the pump by locating where the pump will be mounted as well as the location of the discharge point. The condensate flow will decrease based on the height it will travel until the shut-off or the maximum lift is reached. Before purchase, you should check the lift rating to ensure that the specific pump is suitable for your application. The right pump should also offer output flow that is at least twice the input rate. Other things you should consider include the voltage requirements, power cord and plug long enough for your application, a safety switch, a thermal overload protection and a stainless steel shaft. It is also important to note that units with UL and CSA certification guarantee safety. It is necessary that the condensate water in your air-conditioning system gets drained out to prevent the piping from cracking or even cause improper functioning of your system. The above 10 condensate removal pumps are rated as the best in 2019 with greater flexibility and functionality. 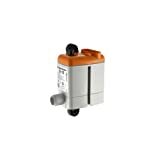 They are also designed for safety with useful features such as a check valve, a thermal overload protection and a safety switch. The tanks are also big enough for everyday use. The units also come with long power cords for greater flexibility and powerful motors for better removal. The pumps can also be used in a wide range of applications as they are well designed to handle the high temperature and contaminants common on condensate water.